Hotel restaurants were once shunned in favor of more adventurous standalone options. But now some of the best eateries, from Vegas to Macau, are a step away from a reception desk. The Hotel Petaluma, a city landmark going through a major makeover, is on its way to becoming a boutique destination, and its month-old restaurant, the Shuckery, fits perfectly into the hotel’s relaxed vibe. Clean walls, good lighting and an open kitchen add to a lively buzz in the often-crowded dining room. The buzz goes beyond the novelty of a new restaurant. 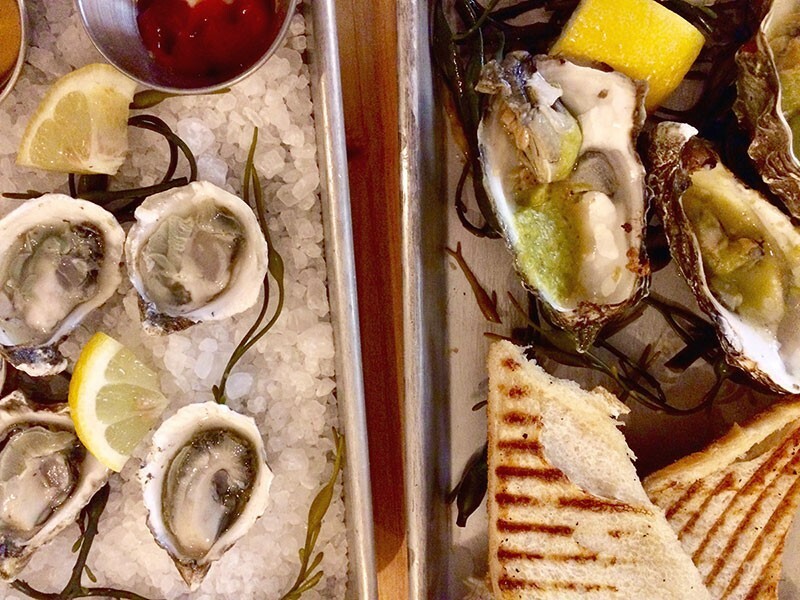 If you’ve attended a few Sonoma County weddings or special events, chances are you encountered the Oyster Girls, the traveling oyster bar by sisters Aluxa and Jazmine Lalicker. Shucking Tomales Bay oysters since 2007, the sisters invited chef Seth Harvey to build a seafood-centric menu in which the oysters are only part of the opening act. Following in the footsteps of modern hotel restaurants, the Shuckery isn’t afraid to take risks. The menu is ambitious and adventurous, and in most cases, it pays off. The raw oysters ($3 each; six for $16; 12 for $30) are natural winners. The Humboldt Kumamoto bivalves, which the waitress recommended, are smooth and satisfying, with a hint of sweetness. Compared to them, the baked oysters in salsa verde (three for $11; six for $20) are too skinny and didn’t deliver the same delicious mouthful. When an ingredient is prepared “two ways,” the chef’s goal is typically to demonstrate creativity and technique, and Trout Two Way ($14), from the Bites sections, does the trick, displaying a delicate trout tartar next to a crispy, skin-on fillet served with yogurt sauce. The vegetarian appetizer, cauliflower Hot Wings ($14), was equally revelatory. Coated in rice flour and gochujang paste and sprinkled with green onion, it was crispy on the outside and surprisingly rich on the inside. The generous portion makes it a worthy option for non-fish eaters. Many North Bay restaurants make decent fish tacos, so it makes sense to opt for something less ordinary at the Shuckery, like the calamari relleno ($26). On the Mediterranean, fried squid is stuffed with crab meat and served with sweet and creamy yellow corn soubise and a refreshing, electric-green tomato and poblano pepper purée. Both sauces are great, and so is the filling, but the squid could have used more salt. The Shuckery has only two desserts on the menu: dueling budinos ($9), a couple of rich mousses, and a bread pudding with peaches and crème anglaise ($9). On the menu, they appear under a heading that reads “If you still got room . . .” We didn’t, and after oysters and seafood, it would be nice to have a lighter, fruitier option. The Shuckery is a promising new restaurant with plenty of pleasant surprises that is already fulfilling the Lalicker sisters’ vision as well as that of a reimagined Hotel Petaluma.